Guinness was one of the most formidable and versatile actors of the post-war period. Appearing in roles as diverse as Fagan in Oliver Twist, to the greatest Ealing comedies, and to Ben Obi-Wan Kenobi in Star Wars, Alec Guinness was much loved for his commanding performances – rich in diversity and depth of character. Alec’s childhood was far from happy. He was born, 2 April 1914; no father was mentioned on his birth certificate. His mother and stepfather displayed little love or concern and his schooling was nondescript. When Alec reached adulthood, he cut off connections with his mother. In 1934, with the help of John Gielgud, Alec Guinness was given his first significant stage performance in Hamlet. In this interwar period, he gained a good reputation for performances in various stage plays. He also married Merula Salaman; they were to be happily married for 60 years – a rarity for the showbiz environment. At the outbreak of war, Alec applied to join the navy; after initially failing, he was eventually accepted and ended up leading a landing craft in the Mediterranean theatre of war. After the war, Alec’s big breakthrough came with his role in two David Leon film’s – Great Expectations and as Fagan in Oliver Twist. It was this that made him a star on the big screen and a household name, overshadowing his stage career. 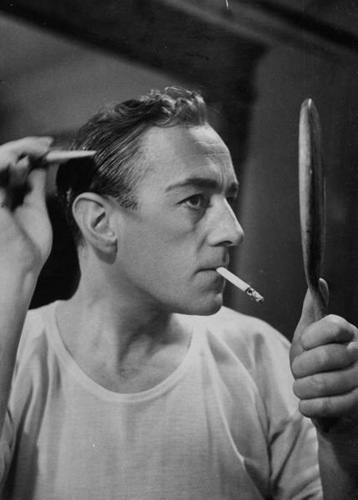 This led Alec Guinness to star in the best of the Ealing comedies during its golden years. His first virtuoso performance was in Kind Hearts and Coronets, where Alec Guinness starred as all eight members of the D’Ascoyne family who were killed by Dennis Price. Though Alec later was somewhat dismissive of the importance of the film, it was widely hailed as a great performance. His marvellous comic touch with a hint of darkness was further explored in other Ealing comedies such as the brilliant – Lady Killers, The Lavender Hill Mob and The Man in the White Suit. Guinness went on to star in some of the most successful films of his generation, including Lawrence of Arabia, Dr Zhivago and A Passage to India. In 1977, he starred in George Lucas’ box office smash – The Star Wars trilogy. Cast as Obi-Wan Kenobi, Alec Guinness was perfect as the wise and intriguing father figure to Luke Sky Walker. The film made Alec Guinness rich as he gained a 2% royalty from the film revenue. However, he later admitted he disliked the cult status that the film brought him. He never wished to be typecast and later said that he had got fed up with the character. By the end of the 1980s, Alec had disappeared into virtual retirement. He had little taste for cameo roles or TV appearances. He valued his privacy and close family life. I am always ashamed of the slowness of my reading. I think it stems from the fact that when I come across dialogue in a novel, I can`t resist treating it as the text of a play and acting it out, with significant pauses and all. Unlike some actors, Alec Guinness was a master of disguise. He could fit into different characters so well, one felt one was watching a particular character – rather than watching the famous actor – Alec Guinness. He was knighted in 1959 and died 5 August 2000, aged 86. He was survived by his wife and one son.